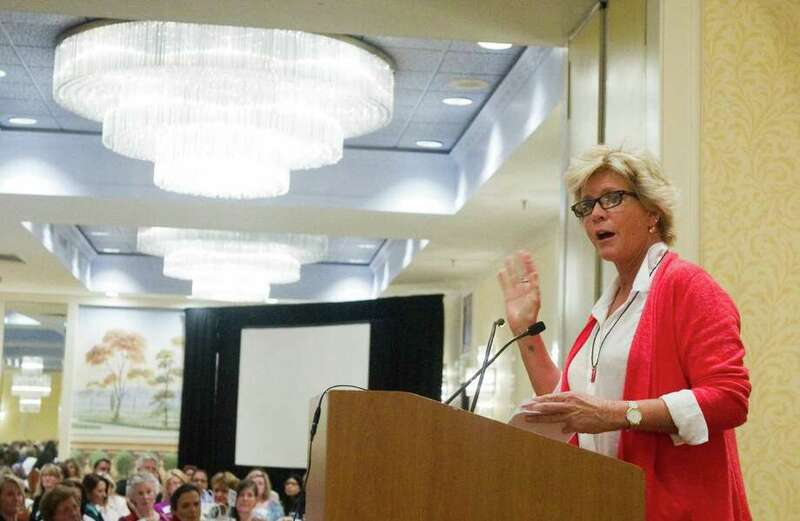 Actress Meredith Baxter speaks about her own experiences with abuse during the Domestic Violence Crisis Center fundraiser at the Stamford Marriott Hotel in Stamford, Conn., May 3, 2012. The sound of broken silence emanated through the ballroom at the Stamford Marriott Hotel on the afternoon of May 3 as more than 500 people -- most of whom were women -- gathered for the 10th annual Voices of Courage spring luncheon, hosted by the Domestic Violence Crisis Center. The annual luncheon is the primary fundraiser for the DVCC, which serves families in mid-Fairfield County, providing education, resources and help for victims of domestic violence. In the past 12 months, the agency has served 3,860 individuals, according to DVCC Executive Director Rachelle Kucera Mehra. "In that time, Peaceworks presented prevention programming to more than 25,000 students throughout mid-Fairfield County and there were 422 women and children, and one man, that we sheltered in our safe houses," Mehra said. "That's one in 10 lives that the DVCC has impacted directly." One in four women on average will experience domestic violence in her lifetime, according to the National Coalition Against Domestic Violence. That leaves a lot of room for new voices to raise continued awareness about the prevalence of domestic violence and raise consciousness of a pervasive public health problem -- one that is often shielded and kept in secrecy. It was with that idea in mind that actress Meredith Baxter, most famous for her role as Elyse Keaton in the 1980s situation comedy "Family Ties," flew across the country to speak about her experiences in marriages in which she suffered violence. "Although there are elements here of a sad story, I really want to leave you with the hope for change," Baxter told the audience. She discussed growing up as the daughter of television star Whitney Blake, who hid Baxter and her brothers from the public eye. The silent treatment and name-calling were rampant in her childhood home, Baxter said. "Because of the emotional abuse, neglect and rejection, I interpreted that I was neither loved nor lovable. There is my belief system," Baxter said. "I concluded all of this by the time I was 5. This belief system, this core conviction, dictated the entire trajectory of my life. This is how abuse when we're little leaves us so ripe for abuse down the road." Baxter said she experienced emotional and physical abuse in two marriages, a secret she held close, never telling co-stars or friends until the very end. When a nanny, who lived with her family for two years, left for another job, she gave Baxter a copy of the book "Men Who Hate Women and the Women Who Love Them." "It gave me that alarm of recognition," Baxter said. But after reading a few pages, she threw it away. "I wanted to not know what I knew. I couldn't acknowledge that I was in an abusive relationship, because that would require action, and I was afraid," she said. It took several attempts of introspection and many years until she was able to acknowledge that her home life wasn't the way it was supposed to be. "I didn't like that we were being hit. I didn't like the shaming or the name calling, but on some subconscious level, I knew what my role was in that relationship. It fit into my belief system, and that's the pattern; that's how it's passed from generation to generation," she said. She can't pinpoint a moment that caused her to pack her things and move on, she said before her speech as she sat in a small meeting room. But she does remember one Thanksgiving, when she was "being shredded for having a terrible dinner." As she cried, her oldest daughter came over and asked simply: "What are you waiting for?" She sought therapy, enrolled in a 12-step program, confronted her dependence on alcohol, which she had used as a crutch through the abuse, and started the long process of self-discovery and healing. Now that she is on the other side of a decades-long battle, her goal is to raise awareness of domestic violence, to share her story and challenge other women with a simple question: What are you waiting for? "Domestic violence is everywhere. I've spoken in many different states. And it's the same. And silence allows it all to continue. I think that it becomes a conspiracy of silence," she said. So she's adding her voice to a chorus of others in an effort to "change the threshold of what we find acceptable." Baxter's wasn't the only voice that was heard Thursday. During the luncheon, the DVCC played audio recordings of several women who benefitted from the center's services. "I feared using my voice because I was told I had no rights," one woman proclaimed. "I imagined using my voice, and then I did when the police came to our home," another said. "I must use my voice and encourage my children and my family that no one deserves to be harmed," one mother said. "I must now use my voice, so this is not my forever," said another. Passing along an understanding of the importance about the not-so-simple act of encouraging women, children and men in need to use their voices is exactly the hopeful ending Baxter mentioned at the beginning of her speech.